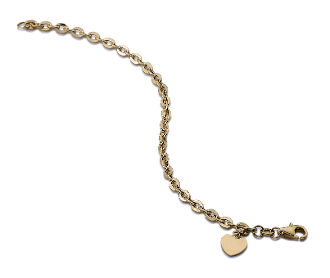 This divine heart charm bracelet is designed in 14 Karat yellow gold, a simple yet fun style that comes alive with sparkle and flare. Measuring 6 inches, the highly polished flat rolo style links secure with a lobster style clasp. The hanging heart may be engraved with up to 3 letters at no charge. A perfect gift to remind her of your unconditional love!